I spent a gorgeous two days in Silloth on the Solway Firth in Cumbria on England’s northwest coast in July. 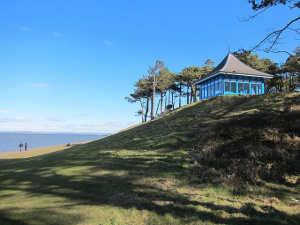 I was volunteering at the Soldiers in Silloth Museum, and while there I was lucky enough to explore this seaside town and spend some time with the friendly and inviting local residents. The focal point of Silloth is the Green , which is one of the largest and longest greens in the UK, and actually is made up of three separate spaces: Harbour Green, Skinburness Green, and what is apparantly just known as ‘The Green.” The park follows the shoreline of the Solway Firth, with Scotland easily visible across the water. It was hot and sunny during my visit, which were the perfect conditions to experience the views and walk the harbour and the beaches. Good blog! I would love to visit their someday!